Where is the simplified Chinese versions of 98 and ME? Could someone find and upload them (if they existed) please? 9x drivers mostly worked, they didn't. Hence more conflicts and crashes. Exactly what happens when manufacturers try to shoehorn one thing into another. At least it works fine on a VM. 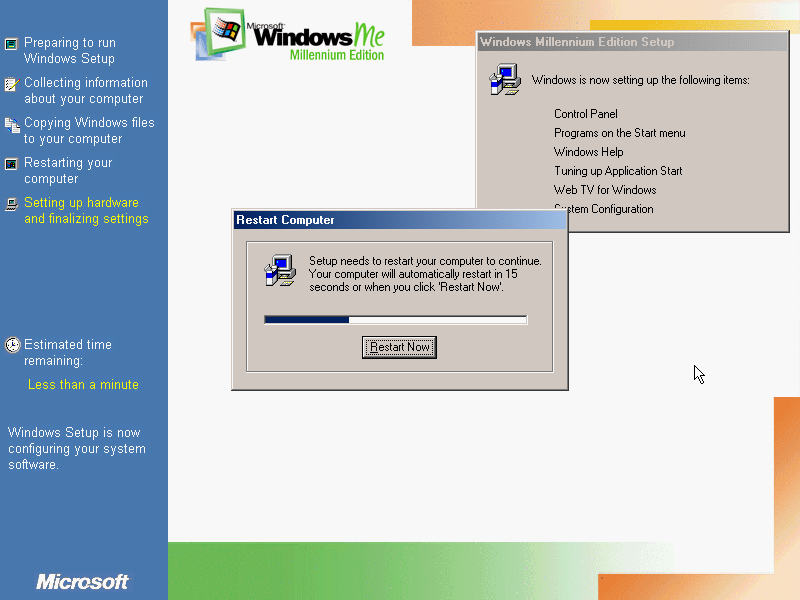 Somehow I can't get the Swedish version of Windows ME to install, not even with a bootdisk! Is something wrong? @ShermanRetroWindowsFan Can you be more specific? What problem are you having and at what point of the installation? Are you not able to get into setup? Is there an error in the middle of setup? Does it not boot after install? Are you installing into a virtual machine (if so, which one) or onto a real PC? I can't get the ISO to mount in VirtualBox, but it does mount through Alcohol 52%. There's either something wrong with the ISO or with VirtualBox's ISO support. I formatted the virtual drive (using MS-DOS 6.22), mounted the floppy and my Alcohol 52% drive on VirtualBox. Once it booted it told me the setup files were not found, so I changed to drive and ran install.exe with default options and without creating a boot floppy and using the first serial listed on the Windows ME page. Everything else went fine. where is the simplified chinese version? 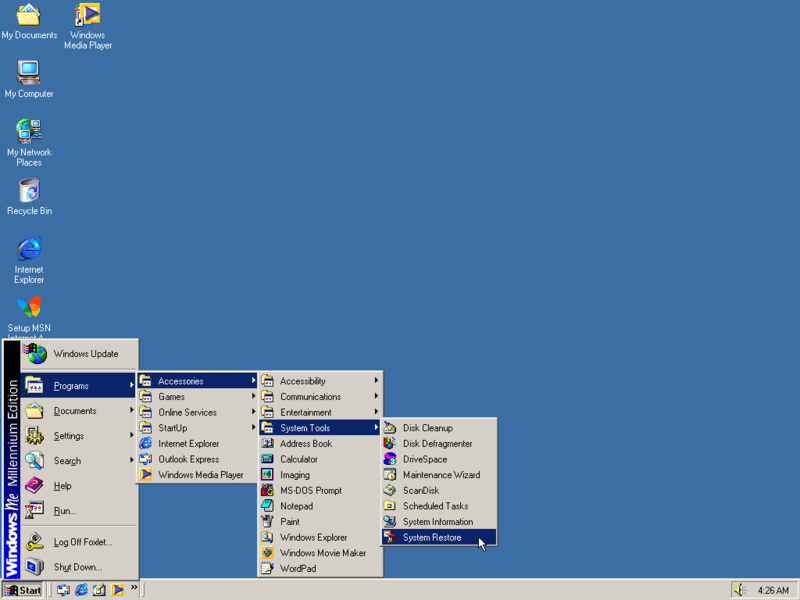 If you're looking for new screenshots for Windows ME, I have some good suggestions for them. 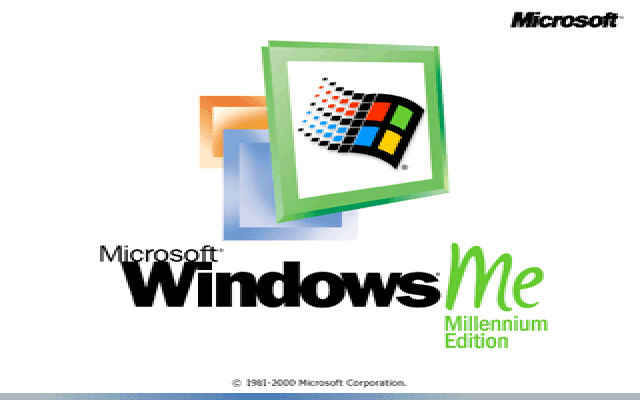 It's interesting to think about how Windows ME probably would have been just as stable as 98 if MS had just kept their mouths shut about the 9x dead-end. Actually, 9x was already pretty unstable ever since the release of 98FE. 98SE fixed a few of the problems, but ME retained a few new instabilities later. Microsoft was planning to merge 9x with NT anyways with Neptune (which eventually was merged with Odyssey to create Whistler). Most PC owners that had a PC that included ME just switched to 98SE or even 2000... It was just that the drivers for 98 weren't for ME. 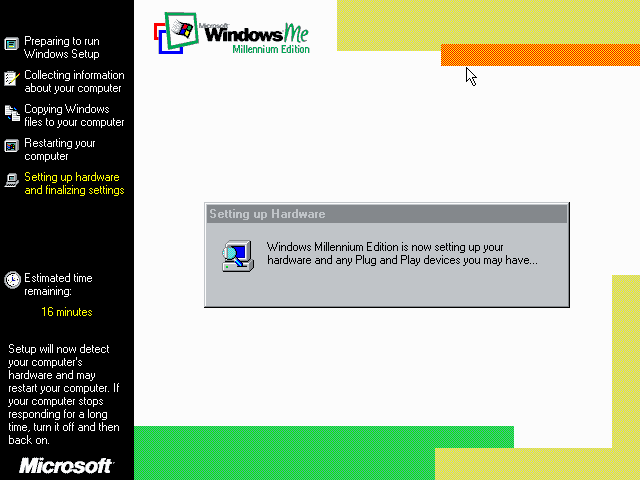 Windows Me in general was an improvement over 98SE on my ThinkPad T41. Faster boot times and overall more stable, that is until I tried to install a USB 2.0 driver stack. I couldn't find a Windows Me equivalent for NUSB, so I just extracted the inf and drivers from the executable; the drivers worked perfectly in 98SE. But in Me, inserting a flash drive blue screened the laptop, so did attempting to update or uninstall the driver for the USB hub in normal mode. Both OSes also had a bug where file transfer operations would freeze everything else; a hotfix exists but I'm not sure of its name. After 45 minutes of this debacle, Windows 2000 SP4 was sitting comfortably in my slimline DVD-RW drive, wiping all remnants of classic Windows' darkest days. @win32 it could have been because the usb 2.0 driver wasn't compatible with Windows ME. @win32 Windows ME comes with a USB Mass Storage driver already, so you didn't need NUSB. If you still need a USB 2.0 driver, a Google search for "usb 2.0 driver windows me" should pull up some relevant results. Windows 9x (regardless of the version) is generally not as stable as NT, so it's actually normal for Windows 2000 to be more reliable than both 98SE and ME. If you have some games/programs that work on 9x but not on NT, you can always try to dual-boot. Did you try different mirrors? What exactly do you mean by slow? 200kb/s 2mb/s? To be honest, I think 200kb/s is enough for a site like this. It is nothing that one would download 100 times everyday. 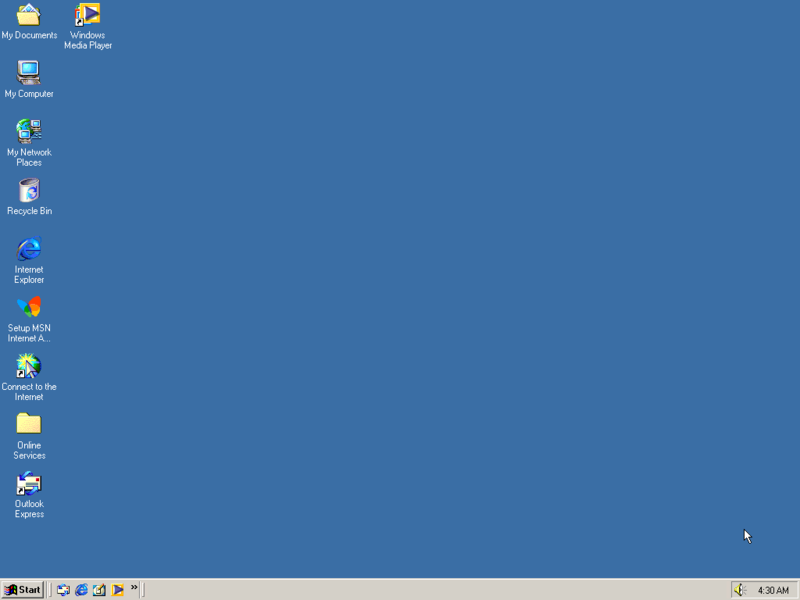 I have Windows ME Polish ISO . How to upload it? Which is the bootable iso?? The OEM Full. If that doesn't work, then none. is a virtual pc file compatible with virtualbox? also is the retail full bootable? 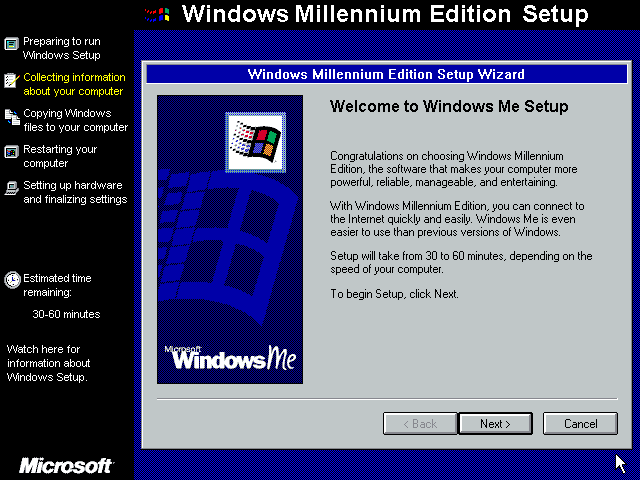 How do you install the Hebrew Version of Windows ME? Just asking. 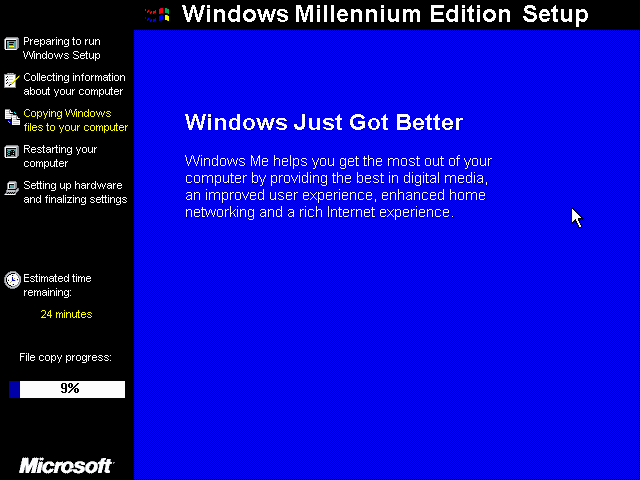 Here's an interesting (and sad) fact: Windows Me shipped with a beta version of IE 5.5 (and consequently the shell). I need help with Oracle VM VirtualBox. I have installed and started ME (German OEM version), but when I click on "VirtualBox GuestAdditions"
to install it I get an error message that it can not be installed. 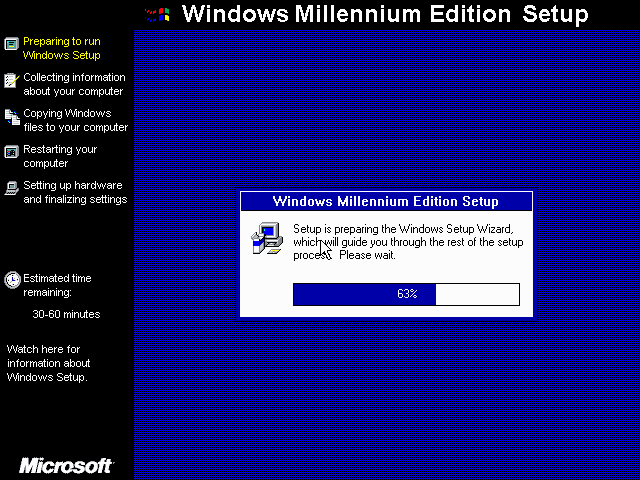 It also happened with Windows 98 Special Edition (German). Any ideas who uses VirtualBox emulator and had same problems? Guest Additions will only work with win 2000 or later. For video drivers you can use scitech display doctor vesa drivers and for shared folders you can set up networking with normales shared drives/folders. My T41 lists 98FE and SE as supported OSes, but not Me (though all 98 drivers will work of course).